This painting depicts the verdant green hills and forest glades that surround the picturesque fishing port of Sanary-sur-Mer, near Toulon, France, where Kisling lived in a number of rented villas between 1924 and 1932 before constructing his own house, La Baie, in 1938. 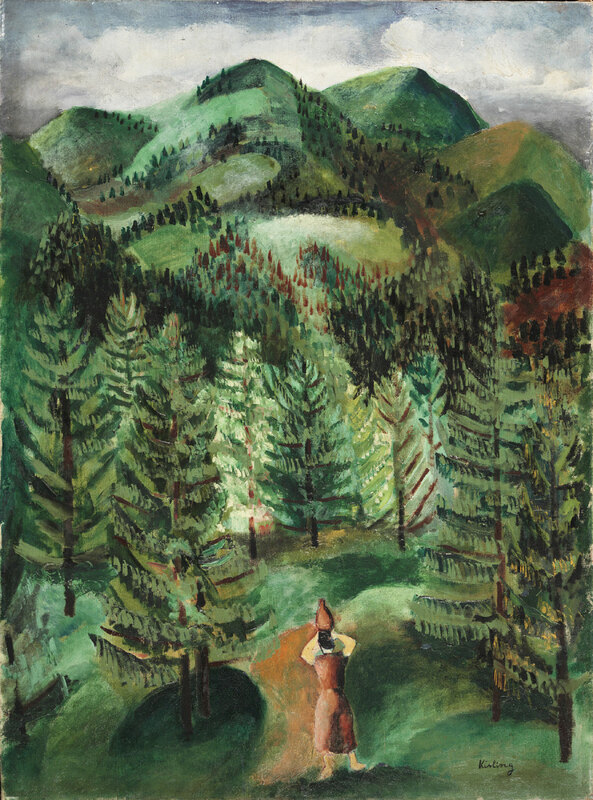 The area's unspoiled wooded landscape became the subject of a number of the artist's paintings in the mid-1920s, although the presence of the statuesque woman, carrying a water jug on her head, is unique in his oeuvre. Seen from the back, the anonymous woman transforms the scene into a timeless, arcadian fantasy that references the Mediterranean region's classical past. George Biddle ; gift to PMA, 1945. 1. Presumably the American artist (born Philadelphia 1885, died Croton-on-Hudson, NY, 1973).